Before the World Cup, South Africa revealed a brand new shirt for the tournament – their second design from Japanese equipment supplier ASICS – and the Springboks have opted to use a tweaked version of that design for the summer fixtures. ASICS claims that the fabric used in the design has been updated and improved, and the lack of the World Cup tournament logo means that the Springbok badge is back in its more regular position on the right breast. Pleasingly, the Springbok is also now fully stitched – when it was on the sleeve, it was a heat transfer, and fine as they are, you can’t beat a proper stitched badge on a rugby shirt. That of course means a classic-style jersey with striking gold accents on the collar and, most notably of all, large gold hoops around the sleeve cuffs – making it the most gold-heavy Springbok jersey in years. 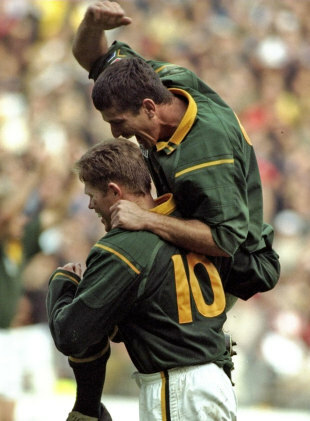 The sleeve adornments, in our opinion, are a subtle nod to the gold parts of the Springboks’ 1999 jersey, but regardless of the motives, it was a great looking design at the World Cup, and with the Springbok restored to the front of the jersey, it’s an even better looking shirt now. The alternate jersey has again been adapted from the World Cup change design, and we’ll be seeing a lot of it in the next month if they stick to test rugby tradition when Ireland visit for their test series. That’s surely not a bad thing, as the combination of a plain white shirt with accents of dark green is incredibly lovely – it was one of the most underrated designs at the World Cup, and a post-tournament decluttering has done it no harm at all. You’ve probably noticed that in a break from the norm, neither of these shirts have a main sponsor – something that’s almost unheard of in modern test rugby – but it’s not something that’s been done entirely on purpose. The SARU has been rocked by a raft of sponsor pullouts following the Rugby World Cup, with main sponsor, South African bank Absa, opting not to renew their deals with either the Springboks, the Blitzbokke or the Currie Cup, while shorts sponsor BMW also decided to call time on their relationship. In the end, amid talk of “having to be creative in how we approach our commercial partnerships” the Boks have managed to secure a short term sponsor for the duration of the test series – Blue Label Telecoms. From what the SARU are saying, they could adopt this series-by-series sponsorship policy from now on, which will mean that replicas are unlikely to be having sponsors on them any time soon. That’s good news if you’re the sort of fan who resents being turned into a walking billboard just to support your team, of course – and there’s no doubt that the lack of main sponsor only serves to enhance the retro vibe of both of these rather lovely designs. switch the Springbok & King Protea emblems about. South Africa will never have a good looking Rugby Jersey till they one do one of the two in my view. I there a reason why there is no South African flag on the jersey’s as well ?? We assume it’s been removed because the on-field jerseys have had the #LoveRugby logo on the back of the collar, where the flag used to be.